Here's a way to turn the routine roar up I-80 into a jaunt through part of the Mother Lode in Placerville. If you like warmth, the Sierra foothills can give you heat, but this side trip also takes you places to cool your feet. The route starts with US Route 50, which splits off I-80 just west of Sacramento. 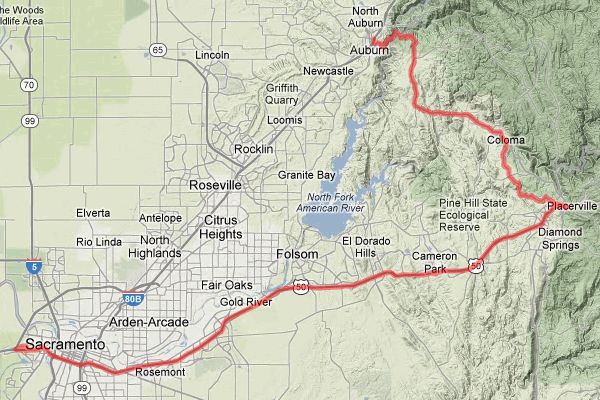 I covered the first part of this stretch in the Folsom-to-Loomis side trip. On this trip, though, you stay on 50 to Placerville, then strike north across the watershed of the American River to Auburn, where I-80 is the ridge route to the crest of the Sierra Nevada. With minimal stops it takes a couple hours, but there are lots of places to linger. Once past Folsom, the road starts to climb into the Sierra foothills. 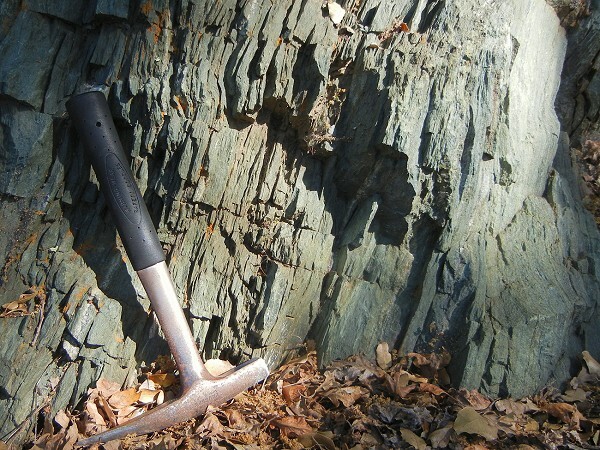 The big range has a wide western fringe of older rocks, much of them about 160 million years old from Jurassic time. 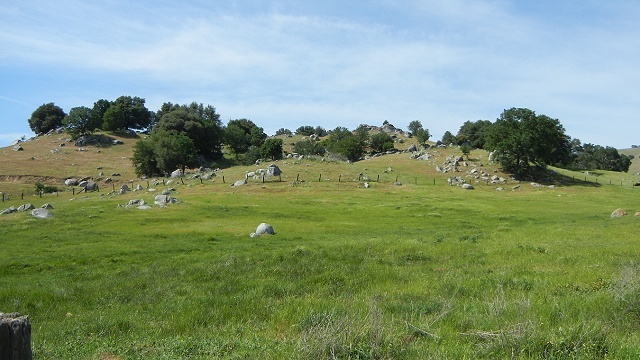 The great batholiths of white Sierran granite are farther east, where this older cover has mostly eroded away. 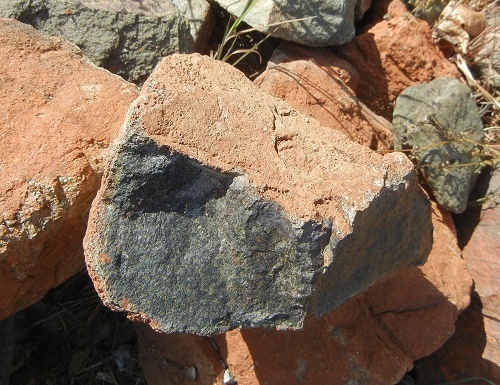 The rocks you'll see are the type that yielded California's hard-rock gold. Here's the geologic map of that part of the route. 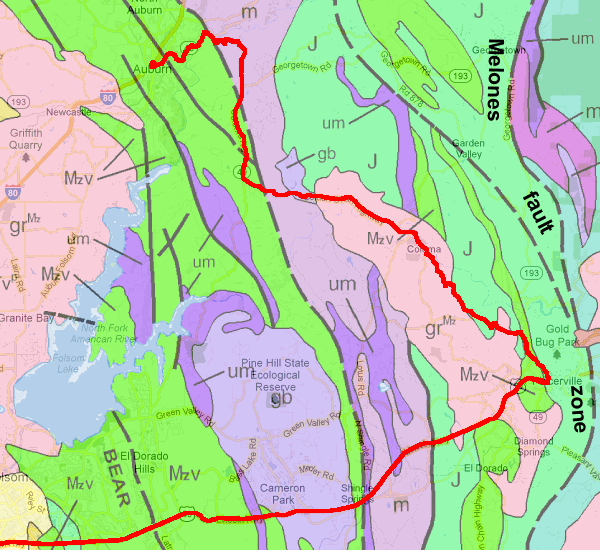 The Mother Lode is a string of gold-bearing quartz veins and related rocks that stretches along the Melones fault zone. That's where Placerville is. This route also goes through Coloma, where the Gold Rush began in 1848. That gold was nuggets in the river gravel, or placer ("PLASS-er") gold. The beginning and the end of the route on the geologic map goes through the Smartville complex, which is the remains of an old volcanic island chain that collided with ancient California in Jurassic time. You won't see it in the landscape, but the rocks around Shingle Springs conceal a major fault inside the complex. There's some very nice slate to be found there . . .
and peridotite, from deep in the ocean crust, with its distinctive density, dark-green color and rusty weathering rind. Serpentine is abundant here too. Placerville features lots of history from its days as a Gold Rush center. Some of the history lurks just off the main street in the form of cryptic diggings and other structures. 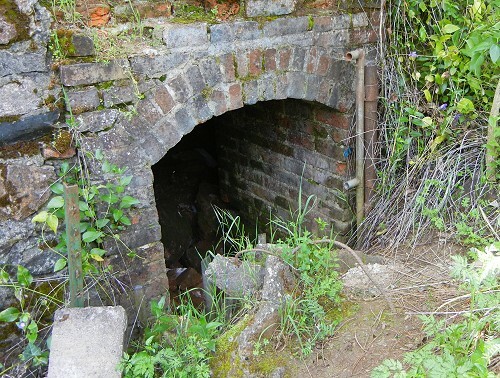 More formally, you can tour the workings of a former gold mine just north of town at Gold Bug Park. 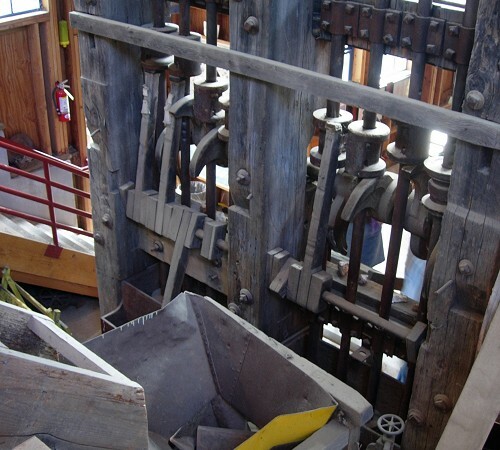 This stamp mill at the park was used to pound the gold-bearing rock into powder for processing. Another destination I can recommend is Lava Cap Winery, northeast of town. 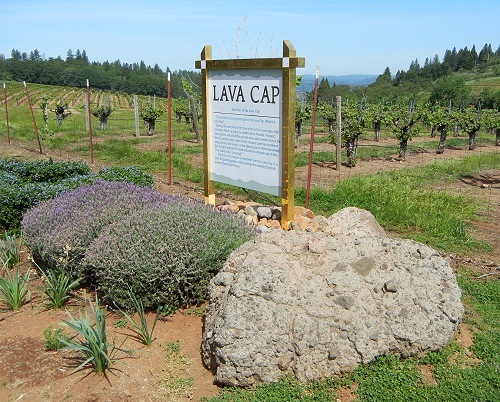 The Sierra foothills are a thriving wine region, but Lava Cap was founded by a retired geologist, the late David Jones of the U.S. Geological Survey. His deep knowledge of rock, soil and terrain informs the wide variety of grapes grown on the property, and lots of Bay Area geologists consider it something of a pilgrimage. The rest of the trip takes state route 49 through the tiny town of Coloma, where a state historic park recalls the earliest days of the Gold Rush. 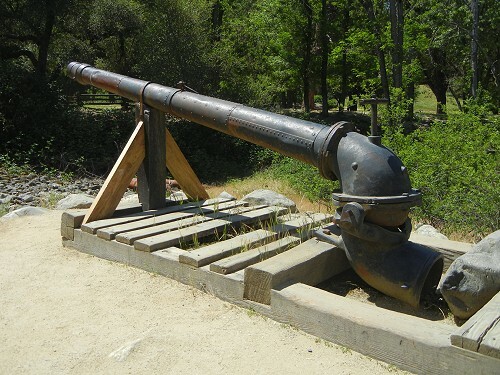 An outdoor museum houses exhibits including this menacing "monitor," which once directed huge streams of water against gravel hillsides to yield the bulk of California's placer gold production. 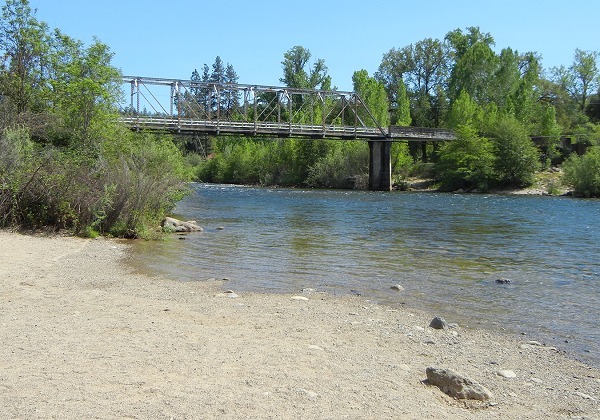 Across the South Fork American River, next to the bridge, is a public gold-panning zone where you can seek your own nuggetsand get your feet nice and cold. This part of the route runs through a small body of granite, which makes for a picturesque countryside as you head north. 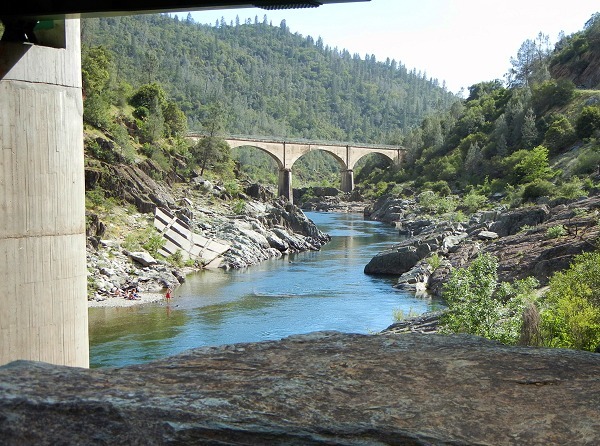 Just past the village of Cool, you'll enter the big gorge of the main American River. The river crossing is a popular spot for boaters and soakers of feet. The old rail bridge downstream from the highway, built around 1900, is reserved for pedestrians today. And of course the rocks, scoured by regular floods, are beautifully displayed. From here a steep climb out of the American River gorge brings you to Auburn and the freeway. Now you can return from taking time to making time.